In early 1942, a lone B-17E of the 435th Squadron, 19th Bombardment Group on a reconnaissance mission near Bougainville is forced down to the deck by weather. Popping out of the overcast sky, pilot John Wallace Fields, navigator Hulet Hornbeck and crew found themselves flying directly down the centerline of a Japanese man-o-war which immediately opened fire. 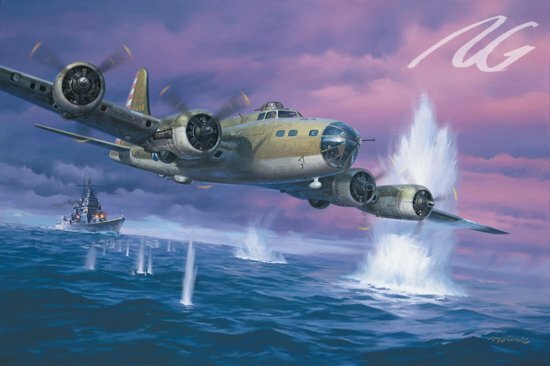 This dramatic image showing the Flying Fortress narrowly evading both the enemy fire and the resulting water geysers evokes the desperate circumstances into which American airmen were repeatedly thrust in the dark early days of World War II. A limited edition of 1,000 printed on 100% acid-free cover stock $40. 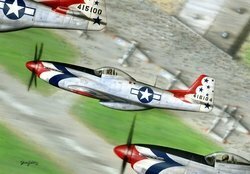 This print shows how it might have appeared if the USAF Thunderbirds had formed in 1947 when the P-51 Mustang was still king instead of a few years later during the jet era. The point of view is from the #2 position of the diamond formation as they bank over an airshow crowd.